When you have said your vows, eaten the cake, danced the night away and thoroughly enjoyed celebrating the most important day of your life with your family and friends, what will you have left to evoke the special memories of this great day? Your photo album, of course! Ensuring you find the right wedding photographer to capture the images and mood of this special occasion takes some time and patience but is well worth the effort. Professional qualifications in many occupations are a reasonable indication of a degree of professionalism. However with regard to photography there really is no substitute for experience and reputation. Ensure that the photographer has a good track record and that bridal photography is their specialism. Ask to see examples of the photographers work, not just the best photographs but an example of a whole album. This will tell you if their ability is consistent. Most couples are not photographers themselves and therefore are not always sure when examining work if what they are seeing is for instance technically good. However you will know if an image is pleasing to you. All technical aspects of professional aside perhaps one of the most important aspects of choosing your photographer is whether you feel you can actually get on with them, do you feel some kind of `chemistry` in your relationship with them. After all, your photographer is going to be encouraging your family and friends to become stars in your show using whatever environments and conditions are available to them and relying on you to sometimes help to stage manage the activities. A good relationship is crucial. They should be patient and calm and have experience of working under pressure. It is wise to never underestimate the importance of wedding photography. How you felt and what you did on that special day will be recorded in images forever and cannot be erased or changed. 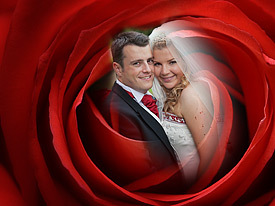 A professional wedding photographer will share your passion for making your wedding day special and memorable. Ensure you have the best person for the job.